A top 5 ad agency builds custom DMPs on Treasure Data to provide state of the art analytics for its global brands. As an international digital advertising giant, Dentsu has long understood the importance of performance metrics. Their innovations in data-driven marketing have helped global brands such as Toyota, Honda, and Sony establish and maintain dominance in the fast-paced world of digital media. 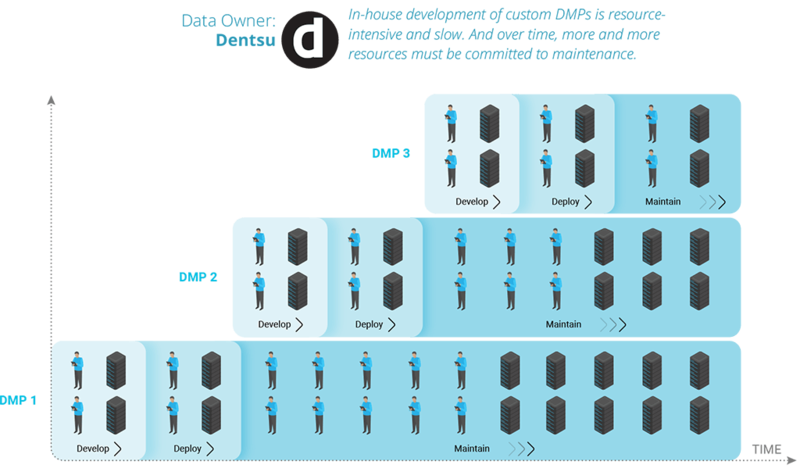 It was only natural, then, for Dentsu to create their own Data Management Platform (DMP), to better understand their brands’ audiences, develop more targeted marketing strategies and maximize campaign ROI. Dentsu thought building a custom on-premise solution would provide a sustained competitive advantage. And they were right. After more than a year of hard work, Dentsu was able to collect and provide access to billions of data points across brand audiences. The platform successfully collected and blended psychographic and contextual data alongside campaign delivery statistics, which quickly unlocked the possibility of building custom data apps like lookalike modeling and audience segmentation. They rolled out the solution for a select few of their largest clients, and it worked beautifully. The rich insights created by Dentsu’s DMP allowed them to optimize their ad targeting and ROI so much that word of this new product spread quickly through their community. Soon Dentsu’s other clients were clamoring for these capabilities, and willing to pay top dollar to get them. But as Dentsu began to respond to this overwhelming demand, they exposed a critical weakness. Each client needed a highly customized version of Dentsu’s platform, blending contextual and psychographic data with the client’s own success metrics to create the best algorithms. This meant that each new account required months of custom integration work to collect data from the customer’s POS, CRM, production databases and more. And each new instance required engineering resources to maintain it. The new program was a victim of its own success. With new insights into their data, clients would see new optimization opportunities they hadn’t seen before, leading them to request additional reporting features. Dentsu owned the data, and adding new features would require more development cycles and more delays as their already-strained IT department struggled to catch up. In order to capture demand without customer churn, Dentsu needed to do something altogether different. They needed to get IT out of the way and empower the data science team to move at the speed of their clients’ demands. When Dentsu discovered Treasure Data, the fit was obvious. Using a fully-managed cloud compute platform, their data scientists could blend data from multiple sources and create advanced analytical workflows on the fly without any resources from IT. Instead of building custom connectors for an ever increasing variety of data sources, they started using Treasure Data’s plug-and-play integrations to set up new data feeds in minutes. 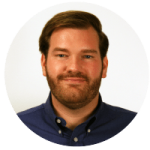 In under a month, they centralized hundreds of customer datasets in Treasure Data’s flexible, scalable cloud. Suddenly there was nothing standing between the data scientists and all the advanced analytics their clients so desperately wanted. The implementation time for each new customization fell from months to weeks, and Treasure Data was able to leverage its ad tech distribution partners to provide an end-to-end, self-service solution. 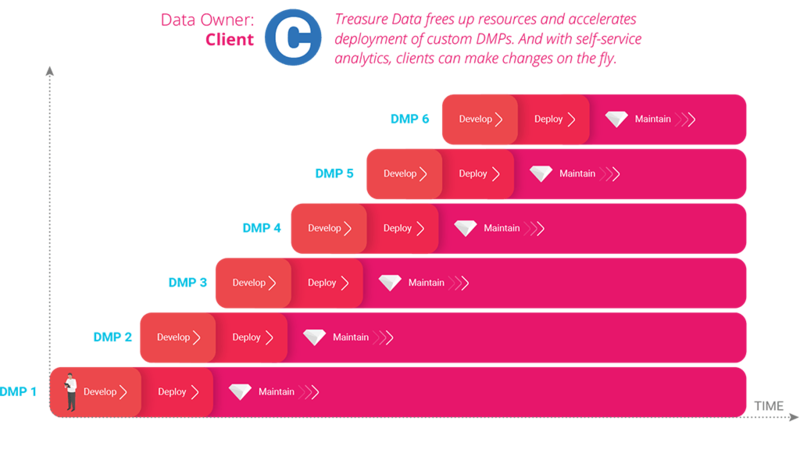 Thanks to Treasure Data, Dentsu.com is now a one-stop portal where all of its clients can discover consumer trends, launch highly targeted campaigns, and intelligently nurture leads, all based on the Treasure Data API. What started out as a great idea has been made better with speed, agility and precision. By removing the obstacles between data and results, Treasure Data has exponentially increased Dentsu’s ability to deliver cutting edge technology to its global brands.